had already been considering investing in nice bag. We went into Nordstrom and they were having a sale on Kate Spade bags! I decided to treat myself to the Cobble Hill - Devin. It was just the right size and I loved the black with gold detailing. The purse has three inside pockets (one with a zipper) and a large outer pocket within the flap. I really liked the design because it could be worn with jeans and boots or with a dress and heals. It is versatile and small enough that I don't load it up with a enough stuff to throw out my back. 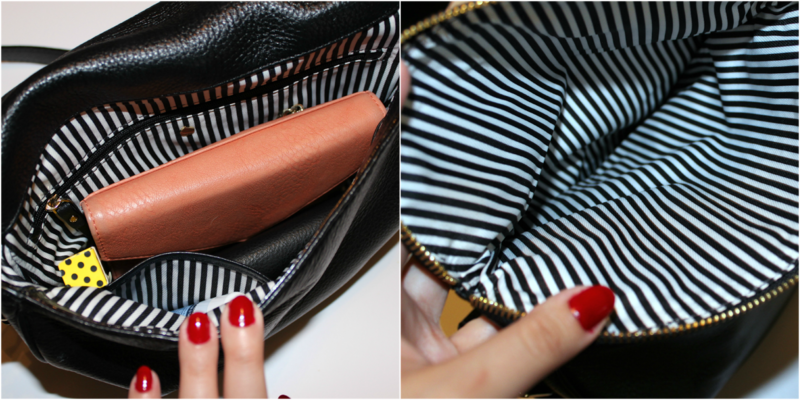 haha The inside is striped black and white giving this purse a sharp look. I like that there is a removable, adjustable strap and the small handle. I know I'll get tons of use out of it and I'm very happy that I treated myself to this for my birthday.